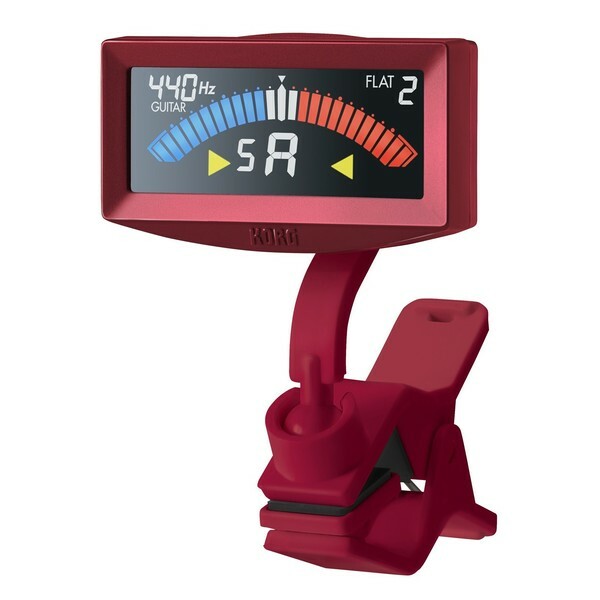 The Korg PitchCrow-G Clip On Tuner, Metallic Red is a very lightweight and slim tuner that fastens securely to the headstock of your guitar or bass for highly accurate and simple tuning. The full colour LCD screen is easy to see, even on dark stages, and the battery provides 24 hours of continuous use. The PitchCrow-G Tuner is a small and sleek guitar and bass tuner that attaches on to any type of headstock. Korg has made the body of this new tuner slimmer, whilst retaining the size of the large, LCD screen. Unused space has been reduced to create a lightweight and efficient tuner. The strong and reliable ball joint is flexible and will hold safely for your entire gig. The PitchCrow-G features a large, LCD screen which is easy to see even on dark stages. With a variety of settings, a wide viewing angle and high brightness, you'll be able to check your tuning status easily and quickly. This tuner offers chromatic, guitar and bass modes as well as flat and capo settings. The clear display with string numbers and note name allows for ease of use, ideal for beginners. A "first string over-winding warning" is displayed to prevent string breakage through over-winding. This is especially useful for beginners learning how to tune. As with all Korg tuners the PitchCrow-G provides users with high accuracy and sensitivity. The ±1 cent mode is ideal for practice or casual playing providing quick and smooth tuning. For professional recording or on stage use, the ±0.1 cent accuracy mode is ultra-precise with a strobe metre display that catches even the slightest pitch discrepancy. This particular tuner has been designed for ultra-low power consumption, lasting three times as long as previous tuners. Battery life allows approximately 24 hours of use and features an auto power-off function when not in use.